There are no dull moments in primary care occupational therapy. One moment you’re discussing how chronic pain impacts your patient’s sleep routines, and the next, you’re helping a person with Graves’ disease adapt daily activities because of changing fine motor abilities. According to Assistant Clinical Professor Ashley Halle MA ’11, OTD ’12, that moment-to-moment variability is part of what makes the practice area so exciting. To some clinicians, that may sound like a groundbreaking approach to occupational therapy. But Halle is quick to point out that primary care topics like health management, wellness and prevention have been cornerstones of the profession for decades. “I think a fair amount of practitioners are doing primary care, they just don’t know it,” Halle says. Yet what does seem revolutionary, especially at the present moment in American health care, are opportunities to showcase occupational therapy’s value as a holistic service that complements what primary care physicians and sites offer. Among what still remains of the Affordable Care Act, alternative payment initiatives like the Federally Qualified Health Center and the Patient Centered Medical Home still hope to transform primary care with better integration, coordination and communication among multidisciplinary providers. Population health, which lies at the intersection of public health and care delivery, is an increasingly cited objective for clinical, regulatory and professional organizations. 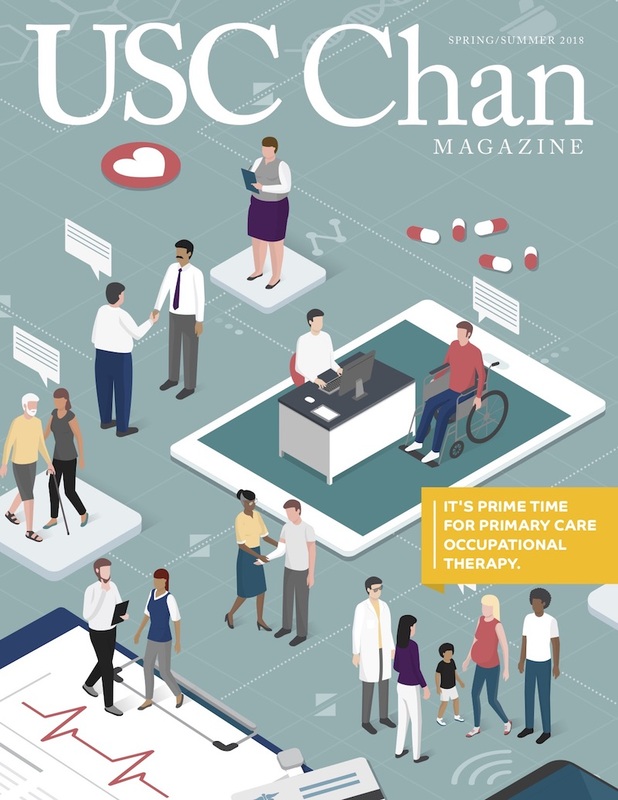 More comprehensive approaches to meeting peoples’ needs have been gaining traction in settings that have long focused exclusively on physical medicine. Halle has made a career out of seeing opportunities on the horizon and maneuvering to capitalize upon them. A licensed occupational therapist for less than a decade, Halle is already among the profession’s most respected experts on this topic. Something is indeed working, thanks in no small part to Halle’s continuing efforts. She was the lead author of a primary care update article published in April’s issue of the American Journal of Occupational Therapy. 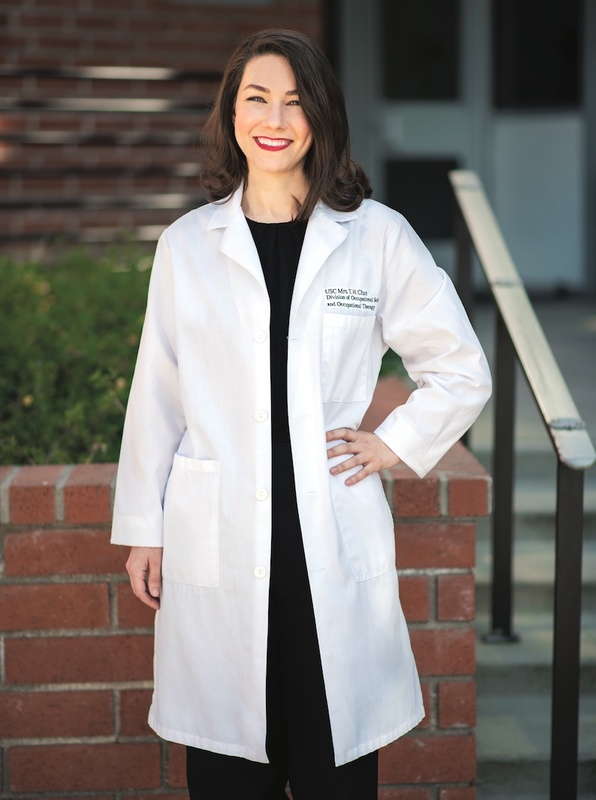 Every spring, she teaches a two-unit elective course on the subject to 30 USC Chan master’s students, and is responsible for mentoring fieldwork students and clinical doctoral residents who are training in primary care sites, including those affiliated with the USC Keck medical enterprise. On behalf of the American Occupational Therapy Association’s Commission on Education, she is co-authoring a new official association document about primary care education within programs’ curricula. That policy and educational perspective is reinforced by the time Halle spends on the frontline of primary care delivery. As part of the USC Geriatrics Assessment Program, funded by a three-year $2.5 million grant from the Health Resources and Services Administration, Halle conducts home visits with older adults living throughout Southern California. During these home safety evaluations, Halle also screens patients’ motor, cognitive and behavioral abilities for safe and independent community living, and can follow-up with her colleagues for any potential issues she flags. What may seem like a throwback to house calls from a bygone era of medicine, Halle says, is actually part of an increasing trend to address patients’ holistic health needs within their places of residence. “It’s incredibly valuable to see where your patients are living their lives, spending the majority of their time,” she says. Showcasing occupational therapy’s value to patients, providers and payers alike will continue to inspire Halle well into the future, even though it is difficult to predict what exactly that future will look like a decade from now. But whether she’s working side-by-side with a patient, teaching the next generation of primary care clinicians or pushing forward profession-wide issues, Halle knows that incremental change is the secret to long-term success.